4.1 Along with a desire to adhere to the findings from the Cole Royal Commission, the government has contended that the legislation is required on economic grounds. The grounds provided as an example in the Explanatory Memorandum are that during the period when the Australian Building and Construction Commission (ABCC) existed, productivity in the building and construction industry improved, consumers were better off and there was a 'significant reduction in days lost through industrial action'. 4.2 The impact of the ABCC on the productivity of the building and construction industry has been a key theme in the evidence provided to the committee. It is also an issue that has polarised submitters. Proponents of the bill cited data that suggests productivity within the sector increased in the periods between 2005 and 2012. In contrast, opponents pointed to: inconsistencies in the productivity data for those years; discredited estimates based on flawed assumptions used in economic modelling; and fallacious findings that mistake correlation for causation. 4.3 The centre of this controversy is a report commissioned in 2007 by the ABCC and drafted by Econtech Pty Ltd (now trading as Independent Economics), (the Report). The Report has been updated several times since 2007, with an update commissioned by the ABCC in 2008, and further updates commissioned by Master Builders Australia in 2009, 2010, 2012 and 2013. 4.4 The Report considers the impact of industry specific regulation on building and construction industry productivity. The versions of the Report up to 2012 assessed whether the Building Industry Taskforce and the ABCC had a significant impact on building industry productivity, while the 2013 Report also considered the effect of the Fair Work Building Industry Inspectorate that succeeded the ABCC. 4.5 Independent Economics make a number of key claims in their reports. The central claim is that building industry productivity has outperformed productivity in the rest of the economy during the period up to 2012 and the major contributory factor in this finding was the presence of the ABCC. 4.6 The Report compares productivity data for the periods before the Building Industry Taskforce was established in 2002; the period from 2002 to 2012 when the Taskforce and then the ABCC were in operation; and then finally the period from mid-2012 when the ABCC was replaced by the Fair Work Building Industry Inspectorate (FWBII). Year-to-year comparisons of construction industry productivity are made using data from the Australian Bureau of Statistics (ABS), the Productivity Commission (PC) and academic research. The difference in costs in the commercial construction and those in the housing construction sector. Rawlinsons data is used to compare the timing of any changes in this cost gap with the timing of the three regulatory regimes. Case studies of individual projects, undertaken for earlier reports by Econtech Pty Ltd and by other researchers, are used to provide comparative information on productivity performance between the three regulatory regimes. 4.8 However in the section: Productivity comparisons in the building and construction industry, Independent Economics add a fourth productivity indicator to their analysis, the number of days lost to industrial action. 4.9 The findings of Independent Economics have been challenged by a number of stakeholders and experts over the years. The committee received evidence that discredits the Report by analysing the assumptions and methodology used by Independent Economics. The figure of 9.4 per cent productivity gain is central to the findings of the reports, and arguably the entire economic case for re-establishing the ABCC. The data used to establish that figure was challenged by a number of submitters. 4.10 Professor David Peetz, from Griffith Business School, the ACTU, and most recently the Productivity Commission, systematically question each element of the Report and the figures and assumptions that are fed into the Independent Economics' Computable General Model (CGE) model that finds the existence of the ABCC was responsible for substantial gains to the economy as a whole. 4.11 The report uses a number of figures when discussing the year-to-year comparisons of construction industry productivity. 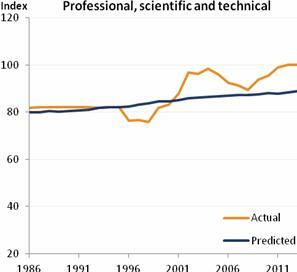 The first is the 21.1 per cent over performance against predictions 'based on historical performance relative to other industries'. The model used to generate the 'predicted productivity' line is not made explicit in the report...The report's approach appears to be to estimate a regression model using data for the period 1985-86 to 2001-02, with the level of construction industry productivity as the dependent variable and the level of productivity for the total economy as the explanatory variable. Independent Economics use the estimated coefficients from this regression to calculate what the level of labour productivity in the construction industry would have been in each year in the ABCC period if the relationship between construction productivity and total economy productivity had remained unchanged from the earlier period...It compares this to the actual level of labour productivity in the industry. The difference between the two lines is ascribed to the influence of the ABCC. The approach is deeply flawed. Construction industry productivity grew faster, relative to the all industries average, in the ABCC period than it had done in the earlier period not because construction industry productivity grew particularly rapidly, but because the all industries average growth rate fell. If you replicate that same methodology for a range of other industries—in fact, the majority of industries—you will find a, so-called, overperformance of much the same sort in a whole range of industries like agriculture, retail, accommodation and food, that have nothing to do, whatsoever, with the ABCC. Source: Actual productivity growth figures from ABS 5204, table 15. 'Predicted' productivity growth figures based on estimation of the model LPi,t = a + �LPtotal,t + et for each industry 'i', using data for the period 1985-86 to 2001-02, as per Equation 1. 4.15 If the Independent Economics' assumption that the ABCC caused the overperformance of the construction industry, then according to the ACTU, it must have equally caused the overperformance in the other eight industries that saw productivity gains against predictions. that the ABCC lifted productivity in construction while some other factor served to lift productivity relative to its predicted level in a majority of other industries at exactly the same time while not affecting construction. There is no particular reason to presume that one can accurately predict what productivity will be in the construction sector on the basis of what productivity is in the rest of the economy. 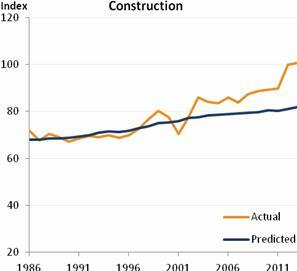 Moreover, according to Econtech, construction industry productivity began to rise above its ‘predicted’ level back in 1997. By 1999, three years before even the Building Industry Task Force, construction industry productivity was exceeding Econtech’s ‘predictions’ by almost as much as in 2007, making the claim of a ‘reform’ effect unwarranted. 4.17 Professor Peetz continues the critique of the approach taken by Independent Economics when considering another year-to-year comparison figure used. 4.19 Similar to ACTU, Professor Peetz accuses Independent Economics of repeatedly seeking to 'find causality when none might be due'. 4.20 Independent Economics' next indicator is the gap between the domestic and commercial construction sectors. In the 2007 version of the Report this is the indicator that provided the 9.4 per cent productivity gain that has remarkably been found using this indicator on its own, as well as a being found using this and a combination of other indicators. 4.21 As discussed earlier in this report the reasoning used in the Independent Economics' Report is that commercial construction sites are more likely to be subject to 'industrial disputes' and 'poorer work practices', in contrast to the domestic sector which is more 'flexible'. Other structural factors could also explain them, including greater on-site complexity (it costs more to affix a plasterboard wall on the 10th floor of a high rise than on a ground floor cottage), higher capital intensity and higher profit margins in the commercial sector. 4.23 The Report cites the productivity of the domestic housing sector as being something the commercial sector should aspire to. However recent reports from the Fair Work Ombudsman's audit program show the terms and conditions of people working in the industry are routinely and comprehensively undermined by employers. These contraventions include non-compliance with hourly rates of pay, allowances, record-keeping and play slip obligations. The audit recovered $192 793.01 for 121 employees. The audit recovered $116 000 for 86 employees. The audits recovered $67 000 for 76 employees. 4.28 The figures show that there is what could be described as a culture of non-compliance in the domestic housing sector in relation to the proper payment of awards and conditions of apprentices. The Victorian figures are startling in that 93.9 per cent of employers are acting outside the law. The other audits reveal this is endemic in other states as well. 4.29 The use of case studies as one of the elements that informs the figure of 9.4 per cent productivity gain has also attracted criticism. Many of the studies were undertaken as part of the 2007 Report and include claims that 'industry participants have also found that improved workplace practices have contributed to cost savings for major projects'. Case studies lend themselves strongly to cherry‐picking of data, as – unlike with analyses of, say, ABS data where others can obtain access to the data and attempt to verify results – the full data in case studies collected are typically not revealed, rather only those selected by the writer are revealed. If cherry-­‐picking is observed in the use of quantitative data, then there is little reason to believe it has not occurred in the use of qualitative data. The ‘case studies’ (which were identical in the 2007 and 2008 reports) comprised one undertaken by the Institute of Public Affairs, a conservative lobbyist and ‘think tank’ (Murray, 2004), and two by Econtech, which boiled down to the qualitative claims of two leading construction companies and data on reduced working days lost due to industrial action, supported in 2009 by extracts from three submissions by advocates of coercive powers. Here and elsewhere, Econtech appeared to confuse reduced industrial action with higher labour productivity. Labour productivity is the amount of real output per unit of labour input (such as the number of houses built per hour worked). Strikes normally mean no output is produced during a period in which no labour is used or paid for, and so have no direct relationship with output per unit of labour input. If reduced industrial action has led to increased productivity, this should be visible in the productivity data. 4.33 The pamphlet purported to analyse the impact of industrial relations on the cost and timeliness of one of Victoria’s largest ever civil construction projects, the EastLink Tollway. The purpose of the paper appears to be a justification for the operation of both the former ABCC and the WorkChoices industrial relations regime. In doing this, the paper seeks to draw a comparison between the cost and timeliness of the WorkChoices/ABCC era EastLink project with the pre-WorkChoices/ABCC CityLink project. 4.34 The paper employs a highly speculative series of 'assumptions', 'estimates', 'expectations', 'likelihoods' and 'probabilities' to arrive at 'estimated', 'probable' and 'likely' total additional costs to EastLink, 'assuming continuous construction' of 'likely' to be $295 million. 4.35 In order to estimate the differential cost advantage to Eastlink over CityLink, the author sets out what he claims are 'probable' excessive labour costs that would have been incurred by the EastLink project but for the existence of the ABCC and Work Choices. Among these probable additional costs are what the author deems 'unproductive days'. All of them include basic conditions such as annual leave, statutory public holidays (including Christmas Day) and rostered days off which for the uninitiated are days off in lieu of additional hours worked during the ordinary hours of work. 4.36 Phillips claimed that since EastLink could be subject to an industrial relations regime that would allow a 'theoretical' 365 days per year construction schedule its cost advantage over CityLink could be $184 million on labour costs alone. 4.37 The author states that '[i]t is not clear if the Eastlink industrial undertakings require non-working union delegates' but that didn’t stop him claiming that they cost '$5 million plus', a figure which inexplicably blows out in the table on the following page to $58.5 million. 4.38 The author also makes up figures of $9.2 million for 'assumed' industrial action over renegotiation of industrial agreements that didn’t happen and $43.3 million for occupational health and safety stoppages that never occurred. For good measure he adds the cost of 'sham weather disputes' that didn’t happen that 'would add an unknown amount in overheads' and yet the author was still able to give a 'likely' cost of $31 million. 4.39 Reinforcing the vague, imprecise and speculative additional cost estimates arrived at by the author, he concludes by saying that his 'posited' figure of $295 million 'could be too high or low, but ... is likely to be conservative.' It could also be a fantasy. 4.40 It is the Committee’s view that the adoption by Econtech of these assumptions further diminishes the value of Econtech’s analysis of productivity in the building and construction industry. ...more than one half of the improvement in lost working days achieved in the first five years of the Taskforce/ABCC era has already been relinquished in the first year of the FWBC era. In fact, in 2012/13, the working days lost in construction was the highest since 2004/05. This sharp increase in work days lost to industrial disputes in only the first year of operation of the FWBC is consistent with the expected reversal of the productivity benefits achieved during the Taskforce/ABCC era. While it is not possible to accurately calculate the construction cost of a day lost[...] If it is assumed that the direct cost of a strike is $100,000 per day then 89,000 days lost to industrial action would equate to $8.9 billion. 4.43 Other submitters argued the assumptions made by the Report do not support the claims that the number of days lost since the ABCC was abolished is evidence 'consistent with the expected reversal of the productivity benefits achieved during the Taskforce/ABCC era'. Firstly, there is the problem with conflating industrial days lost with labour productivity figures discussed in the previous section. The second substantive criticism is that the figures do not actually support the argument put forward in the Report. The reality is that disputation data vary substantially from one quarter to the next, and Econtech conveniently overlooked this fact when attempting to justify a major deterioration of construction industrial relations under the FWBC. During the ABCC's operation, there was an average of 9.5 working days lost to disputes per 1000 employees per quarter in the construction industry. In the four quarters after the abolition of the ABCC, the rate of disputation in the industry has been below the ABCC-era average twice (in December 2012 and June 2013) and above it twice (in September 2012 and March 2013). [I]n this industry, in fact, as in all others when you look at the industrial action statistics, the overall level of industrial disputation in our economy is so low—so low—that a very small number of disputes can cause a spike in the graph. Because the incidence of industrial disputes is orders of magnitude lower even than it was under early iterations of Howard government industrial law, one or two disputes move the needle. 4.47 To add further weight to this argument the latest quarterly figures on days lost per employee due to industrial action was the second lowest since 1985 and the lowest since 2008 when the ABCC was in operation. 4.48 The other point made during the inquiry in relation to days lost was whether they were as a result of lawful or unlawful industrial action. As far as the committee understands, the ABS figures from any period do not disaggregate the figures by days lost through protected and unprotected industrial action. 4.49 The long list of stakeholders unconvinced of the figures and conclusions of the Report now includes the Productivity Commission (the Commission). In its draft report on public infrastructure the Commission expresses doubt on the claimed productivity growth rates that Master Builders Australia rely on through their commissioned report from Independent Economics. The series of studies have been highly influential in debates about the effectiveness of the ABCC on construction productivity, and by inference, relevant to various conjectures about the degree to which diminished union power affects productivity at the macro level. Most umbrella groups representing construction and other businesses have highlighted the studies and claimed that they are valid... The validity and interpretation of these studies are therefore key issues. 4.51 The Commission noted that the Report was two-pronged in its approach to measuring productivity. The first uses historical data to predict growth and then measures that against actual growth. The Commission then notes that the model's appropriateness cannot be measured because 'no statistical model (or specification tests of that model) was provided', and that the 'likelihood of misspecification is high'. The Commission concludes that 'As it stands, IE’s predictive model should be given little weight'. First, no judgment can be made about the effects of the FWBC from the data currently available. There is only one year of data and the conclusion ignores the fact that, even during the ABCC period, relative costs sometimes rose. Second, over a longer period, the link between the IR regimes and productivity is not robust. Third, even if the IE numbers were robust, concluding that IR is the exclusive factor explaining the trend fails to consider a range of rival explanations and considerations. 4.54 The report from Independent Economics is pivotal in the debate over the purpose and effectiveness of the ABCC and the FWBC regime that replaced it. Almost every single argument by proponents of the legislation travels through this prism to arrive at conclusions and ultimately recommendations for action, based on the impact that the ABCC had on the productivity of the building and construction industry. The difficulty the Committee has with this approach is that the evidence suggests the methodology and assumptions used by Independent Economics throughout its series of reports are at best, not robust. 4.55 The Committee is deeply concerned that the fundamental figure of 9.4 per cent productivity gain, initially arrived at through a flawed analysis of the gap between residential and commercial construction only, is regurgitated in all of the reports since. The Committee does not find that reaching this figure afresh each year is plausible, despite the calculations being based on more variables and updated data. 4.56 The second fundamental flaw in the Report is that it does not prove any productivity gains are as a direct result of the existence of the ABCC. The evidence received throughout the inquiry raised a number of economic and administrative factors that could and do impact the economic performance of any sector of the economy. The report discounts all of these in favour of the view the ABCC alone is responsible for the productivity growth. Again the Committee does not find this conclusion plausible. 4.57 The committee is highly sceptical of the findings of the Report, and the methodology used by Independent Economics. The report appears to continually 'beg the question' it sets out to answer, confuses correlation for causation, and repeatedly relies on estimates based on spurious assumptions. 4.58 The Wilcox Review found that the 2007 Report is 'deeply flawed', and 'ought to be totally disregarded'. This was after Econtech, as they were then trading, had had the opportunity to respond to the criticisms put to them by Justice Wilcox. 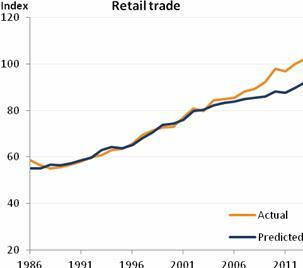 In 2014, the Productivity Commission finds it neither reliable, nor convincing. The list of other detractors comes from across the political spectrum, and includes academics, unions and major business consultancies. The Report, its methodology, and its conclusions should be disregarded in its entirety.